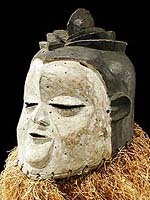 Worn during male initiation ceremonies, masks like these represented all departed ancestors. 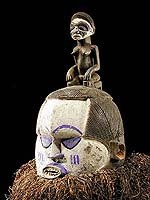 Mourning songs were sung during the ritual; the vertical lines on the face are tears. 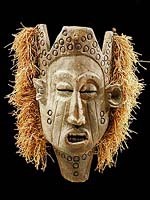 Neighbors of the Yaka, Suku masks are more conservative in their facial treatments. 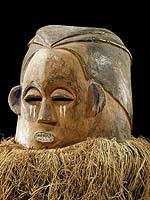 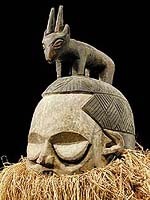 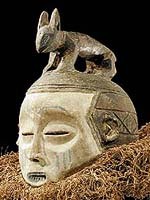 Although styles vary, there is usually a massive collar of raffia and often a figure or animal on the top of the mask. 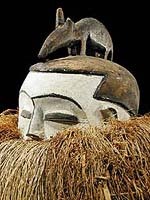 The measurements are first for the mask, then the mask including the raffia. 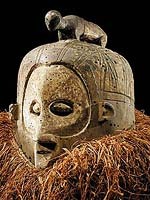 Only #25 is not a helmet mask. 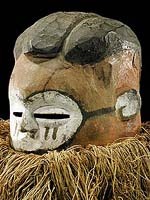 Masks 1, 9, 13 and 20 have an extension in the front on the bottom for holding/steadying the mask by hand when worn. 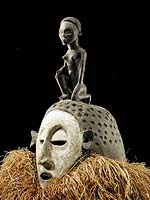 Details on those pages. 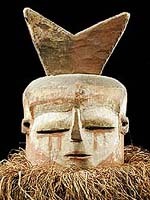 Despite their apperance, these masks show no evidence of having been danced and were probably made to be sold.